Charcoal proposal sketch for Fresh Page installation, CiCi Blumstein 2001. 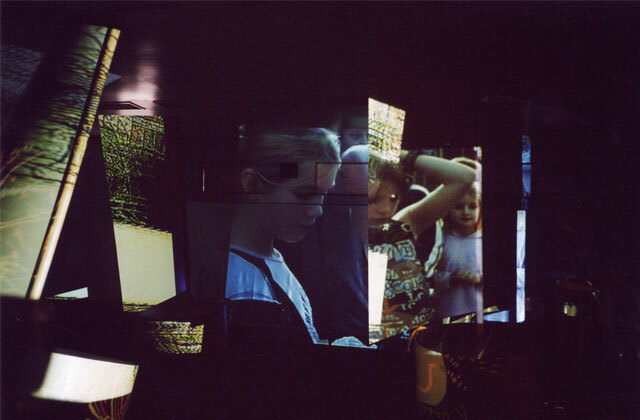 FRESH PAGE – a series of art events, community & schools workshops, kinetic video installations and documentary films commissioned by Libraries, Arts and Heritage, Leeds and created during a 9-month residency to celebrate the building of a new library in Rothwell, 2001 – 2002. Fresh Page invited local people to own and welcome a changing public space in their village by interacting with it in its raw state. The project combined live art, architecture and performative public consultation. The following interventions took place on or in touching distance of the building site over the last months of building works. Fresh Page – dancing on new library building site, Leeds. CiCi Blumstein 2001. Fresh Page – installation view [close-up bricks] new library building site, Leeds. CiCi Blumstein 2001. Fresh Page – project research photos, new library building site, Leeds. CiCi Blumstein 2001. “The new Rothwell Library will be open to the public from 16th March. This is part of the story of designing the new Rothwell Library with the help of the community: Shopping trolleys full of bricks are not usually part of the library’s decor! But everybody involved in the workshops & installation at the new Rothwell library site put loads of energy & support into these rather unusual goings-on. With the emphasis on imagination, design and hands-on creativity, the proposed style for the library is futuristic, funky and artistic. We’ve been testing the idea of this by asking all sorts of people how they’d imagine a library of the future, reading in the future. This works like a magic potion, and it’s amazing how excited the average person can get about library design & reading, how far they’ll go with their ideas!! […] We created a bit of a buzz & attracted attention to the new library in a direct, accessible and slightly loopy way – reaching a much wider audience. Time Lapse Tea Party – performance & installation view, new library building site, Leeds. CiCi Blumstein 2001. Time Lapse Tea Party – Ammonias Schnezbiscuit & Vera, new library building site, Leeds. CiCi Blumstein 2001. 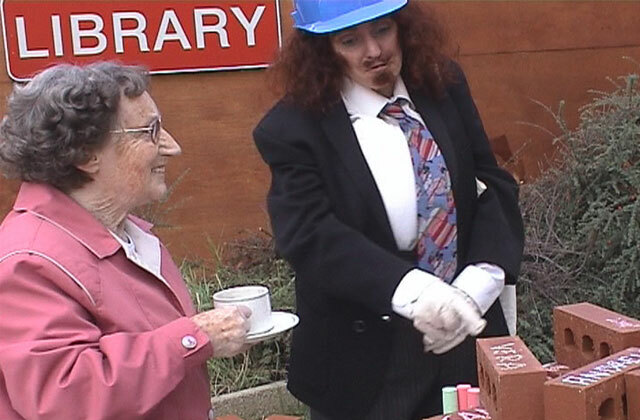 Time Lapse Tea Party – installation view [signed bricks], new library building site, Leeds. CiCi Blumstein 2001. The recordings captured during the public event and on the building site during construction were edited, layered and time-lapsed into a documentary film, which was shown at the launch of the new Rothwell Library as a large-scale sculptural projection [ See Event Three ]. The inspiration for the installation was the idea of a permeable space made entirely out of paper – a defined but open structure that allows ideas, images and sensations to travel in and out, like breath. A space that invites a flow-through of movement, and attracts your attention in all dimensions and directions. Based on this concept, over 250 children from two Rothwell primary schools created their own library of the future, drawing architectural plans inspired by the actual library plans, designing personalized library cards, making paper sculptures, and collecting sounds for the final multi-media installation in the village hall. The artists led several school workshops prior to the installation. These workshops inspired new ideas and developed simple design and construction skills which were further developed in follow-up sessions led by local teachers. Activities were designed to involve every child in a simple, direct way, creating something that is individual and personal. The children designed their own imaginary library cards, book covers, and a reading forest. The workshops also concentrated on designing and building larger elements (paper sculptures) for the installation, with the aim to generate lots of ideas about reading, books, communication and architectural space around a library of the future, rather than to create a finished product. The children’s ideas and themes were worked into the installation as it grew. The artists then designed a virtual library interior made from the installation elements created in these workshops. The design of these elements took everyday objects like books, shelves, desks, chairs, partitions etc into new and imaginative dimensions, making visible the future vision for the new library: to be a place of ideas, imagination, vision, discovery & learning. By installing these elements in an open space [the village hall], new flow patterns of people, themes and materials emerged within the space. 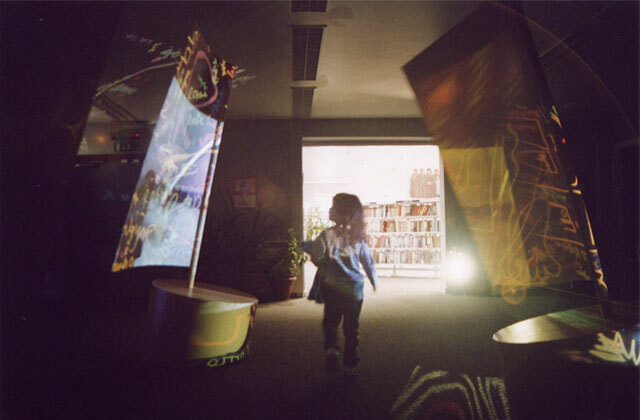 The installation directly reflected the expectations, wishes and needs of the library’s future users, creating a 3D space of physical imagination. At once ghostly white and colourful, this paper interior was transformed by light and slide projections, and brought to life through short, spontaneous performances. 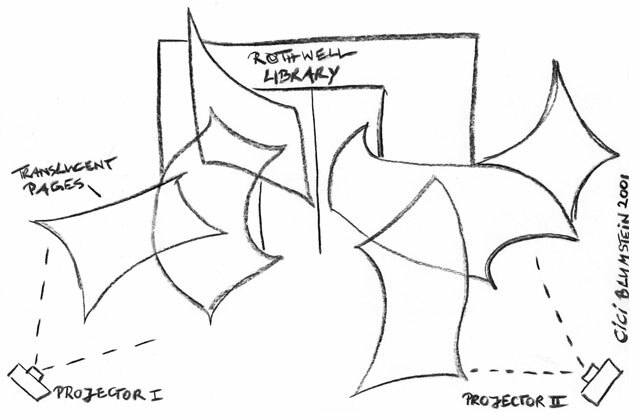 The making, installation and public viewing process was documented on video and shown at the launch of the new Rothwell Library in February 2002 [ See Event Three ]. For the launch of the new library building, the artists created a kinetic sculpture with sound and video installation located inside the building. The sculpture was designed to animate the new library with huge, turning pages as if torn from an open book, symbolising dynamic change and a new beginning. Two distinct documentary films created from footage of the previous two events were projected onto the slowly turning pages. A sound installation captured the moods and voices recorded during the residency. The public were able to walk between the moving sculptures, and experience the work intimately.